The Chinglish Files by olr: Going back in time. No, there ain't no chair vomiting around. 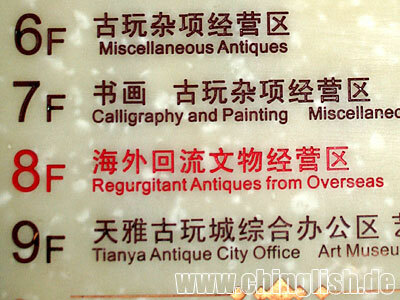 "Regurgitant" and its Chinese counterpart 回流 hui2liu2 mean nothing more and nothing less than "flowing back". Except that you would find this Latin term in a medical report rather than at an antique market. My suggestion: Chinese antiques returned from overseas. My friend Silvano pointed out that hui2liu2 usually implies a historical perspective. Antiques taken, for example, by the 八国联军 ba1guo2 lian2jun1 or "Joint Army of the Eight Powers" after their successful suppression of the so-called Boxer Uprising in Beijing in 1900. So from a nautical perspective the vomiting chairs and chaiselongues are basically booty. I will have to go to that place and see for myself when the stuff actually had left China and under what circumstances. Shot in Beijing. Many thanks, Wiltrud! Ich werde dich immer unterstuetzen, fuer immer!